Benjamin S. Persons, IV is dedicated to achieving the best possible results for his clients. Mr. 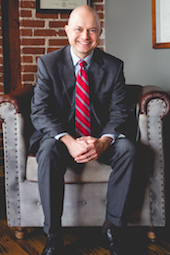 Persons has been practicing law in Georgia for over 12 years and 100% of his practice is devoted to personal injury and wrongful death litigation. Mr. Persons represents people not corporations. After receiving his undergraduate degree from the University of Georgia 1996, Mr. Persons obtained his Jurist Doctorate from Mercer University's School of Law in 1999. He spent the first several years of his law career working for prestigious Atlanta law firms representing large Fortune 100 corporations and insurance companies. He specialized in the defense of cases involving catastrophic injury and death resulting from tractor trailer collisions and medical malpractice, representing the Nation's largest trucking companies and the primary insurer of doctors in Georgia. Mr. Persons knows the strategies used to oppose injury and wrongful death claims and uses his unique knowledge for the benefit of his clients. Mr. Persons is a member of the Georgia Trial Lawyers Association, the American Association of Justice, the Cobb County Bar Association, the Cobb County Trial Lawyers Association, and the Buckhead Bar Association. He lives in Marietta with his wife and three children where he is also an active member of Marietta's First United Methodist Church.